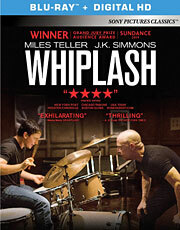 WHAT: Jazz drummer Andrew Neiman (Miles Teller) doesn’t just want to be great; he wants to be one of the greats. When he’s given an opportunity to attend Shaffer Conservatory, the top music school in the country, under the tutelage of tyrannical instructor Terrence Fletcher (J.K. Simmons), Andrew is pushed to his limits and beyond by Fletcher’s extreme teaching methods. WHY: A gripping, electrifying and brutally unrelenting thriller, Damien Chazelle’s sophomore effort draws you in from the very first beat of the drum and never lets go, like a freight train of intensity and emotion that leaves you breathless and your heart still pounding when it’s over. “Whiplash” isn’t just one of the best movies of the 2014; it features perhaps one of the best endings to a movie ever. Chazelle doesn’t waste a single frame in this pressure cooker of a story about a young musician so determined to achieve greatness that he’s willing to do whatever it takes to get there, even if that means enduring the physical, verbal and psychological abuse of the one man capable of squeezing out every last drop of potential. Miles Teller is phenomenal in the lead role, capturing Andrew’s commitment and passion to his craft with an all-in performance that’s soaked in literal blood, sweat and tears, but it’s J.K. Simmons who steals the show with his turn as the borderline psychotic Fletcher, hurtling insults like a drill instructor (think R. Lee Ermey in “Full Metal Jacket”) that are as funny as they are frightening. The film has earned a lot of attention for these two performances, although it would be short-sighted not to mention the superb writing and dynamic editing as well, because they’re just as essential to its success. For a movie about perfection, “Whiplash” comes pretty damn close. EXTRAS: In addition to an audio commentary by writer/director Damien Chazelle and actor J.K. Simmons, there’s a featurette about famous drummers and their craft, footage from the movie’s premiere at the Toronto International Film Festival, a deleted scene and the original short film. WHAT: Following the events of the last film, Nick (Jason Bateman), Kurt (Jason Sudeikis) and Dale (Charlie Day) decide to become their own bosses by inventing a product called the Shower Buddy. But when their key investor (Christoph Waltz) backs out at the last minute, leaving them with thousands of dollars in inventory, the guys decide to kidnap his jerk son (Chris Pine) and hold him for ransom. WHY: When it was announced that Warner Bros. was moving ahead with a sequel to their breakout hit, “Horrible Bosses,” it sounded like a pretty awful idea, especially due to the nature of the original premise. That’s probably why Seth Gordon decided not to return as well, so credit to co-writer/director Sean Anders for not only having the balls to take over the reins, but for coming up with an idea that actually makes sense. Sadly, while the kidnapping plot does allow for Nick, Kurt and Dale to embark on yet another criminal misadventure, the film itself is a mixed bag. Though there are some really funny bits thanks to the chemistry between the three leads (as well as a scene-stealing cameo by Kevin Spacey), the characters themselves have been downgraded from bumbling fools to complete idiots. It may have been cute the first time around, but there’s simply no way these guys could be this dumb and still expect the audience to root for them. “Horrible Bosses 2” is better than expected thanks to its ensemble cast, even if Jennifer Aniston and Christoph Waltz are mostly wasted in their roles, but unlike the first movie, it fails to give you a reason to care. EXTRAS: There’s a making-of featurette, alternate line readings/outtakes, a brief look at filming the high speed chase sequence and some silly infomercials. WHAT: Following the horrific death of Tara, Jax (Charlie Hunnam) exacts his revenge against the people he believes to be responsible, setting off a series of violent events that not even Gemma (Katey Sagal) – the real culprit – could have imagined, which puts the fate of the club and everyone she loves in danger. 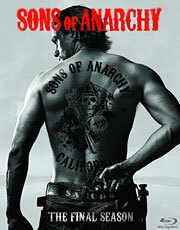 WHY: “Sons of Anarchy” creator Kurt Sutter has gone on record numerous times about his intention for the show to last seven seasons, and while its increased popularity over the years provided him the chance to see that vision through to the end, it wasn’t without a few bumps along the way, particularly in the final two seasons. The FX drama has always been like a macho soap opera with its ridiculous plot twists, but after the poorly handled death of Tara in Season Six (among a few other quibbles), the quality of the storytelling started to wane, culminating in a season finale that felt more like a copout than a worthy bookend to Sutter’s Shakespearean crime saga. One of the biggest reasons the show thrived for as long as it did was its supporting cast, and those players shine brighter than ever in Season Seven, especially Tommy Flanagan, Jimmy Smits and Mark Boone Junior. The subplot between Kim Coates’ Tig and guest star Walton Goggins’ Venus is also weird but sweet, while Marilyn Manson fares surprisingly well as the local leader of the Aryan Brotherhood. The finale will still leave a sour taste in the mouth of fans who expected a more satisfying ending, but “Sons of Anarchy” is more about the ride than the destination, and that’s something not even the mildly disappointing seventh season can tarnish. EXTRAS: The four-disc set includes a retrospective on the final season, featurettes on the show’s legacy, motorcycles, tattoos and guest stars, deleted scenes and a gag reel. WHAT: After his nanobot technology is stolen and his older brother dies in the fire used to cover up the theft, teenage prodigy Hiro (Ryan Potter) sets out to exact revenge on the masked man responsible. But when Hiro and his brother’s healthcare robot, Baymax (Scott Adsit), are unable to capture the mysterious villain on their own, they team up with a group of tech-savvy friends to bring him to justice. WHY: Based on the little-known Marvel comic of the same name, “Big Hero 6” is the first truly collaborative effort between Disney and the House of Ideas, and it’s a match made in superhero heaven. Though the influence of animated films like “The Iron Giant” and “The Incredibles” (both directed by Brad Bird, oddly enough) is undeniable, “Big Hero 6” is very much its own movie, packed with gorgeous visuals and a solid mix of action and comedy. 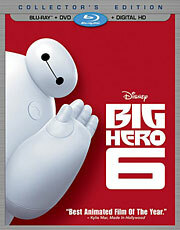 It also proudly wears its heart on its sleeve, with the relationship between Hiro and Baymax key to the film’s success. Baymax may feel like a compilation of classic cinema robots (from WALL*E to C3PO), but he’s the MVP of “Big Hero 6,” thanks largely to Scott Adsit’s vocal performance. The supporting characters aren’t developed nearly as well as the main protagonist (an issue that will hopefully be remedied in the inevitable sequel), and the villain’s motivation is pretty weak, but the whole film is such breezy fun that it’s easy to forgive those minor shortcomings. With any luck, “Big Hero 6” will only be the start of more obscure Marvel comics getting the animation treatment, because it’s an avenue that Disney hasn’t exploited as much as they should. EXTRAS: The Blu-ray release includes a making-of featurette, a look at the animators responsible for bringing the movie to life, some deleted scenes and Easter eggs, and the excellent short film, “Feast,” that played beforehand at theaters.